How was your commute today? According to the MTA, the software problems (caused by the weekend work that shut down the line all day Saturday and Sunday??) that ruined your morning ride to work are still going on this evening. 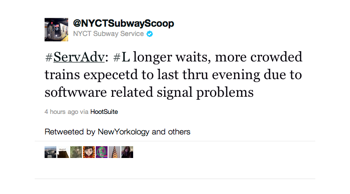 In fact, it’s so bad that @NYC_L_trains hasn’t even bothered tweeting its daily “L train service has resumed with residual delays” message. Remember, it’s this switching software that is supposed to improve headway on the L train, making it possible to run even more trains per hour during peak times. It’ll be great. So long as there no sick passengers. And no stuck doors. And no inclement weather. And no more software glitches.